The big news in Tokyo right now is the current visit from Prince William (without Kate, whom didn’t make the trip due to her pregnancy). While here, he is having A LOT of tea…with Tokyo Governor Yoichi Masuzoe, Emeror Akihito, Empress Michiko, and Crown Prince Naruhito. Then, he will be relaxing and unwinding in a traditional Japanese hot spring bath with Prime Minister Abe. This entry was posted in mike on February 27, 2015 by jules453. In the US, the infamous Taco Bell has made quite a name of Doritos Tacos Locos. It is (probably too often) discussed that Taco Bell does not exist here in Japan, except for a couple locations on military bases. However, to try to keep up with the ‘loco-ness’, Doritos periodically releases some pretty crazy flavor offerings; which we have covered here a couple times previously. Today’s trip to the local grocery store (Hanamasa) resulted in a new Doritos flavor find. 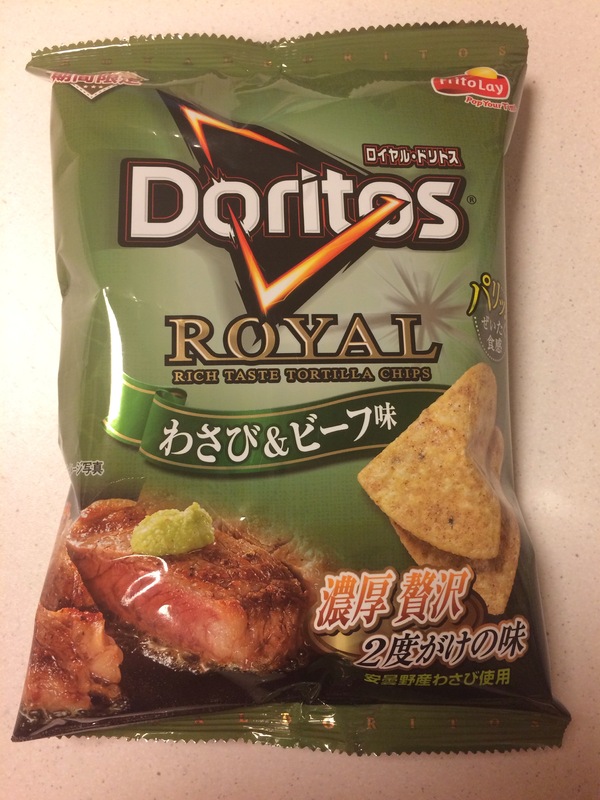 How does “Steak and Wasabi” Doritos sound? Honestly, they were a little more wasabi than steak flavored; but, both tastes came through and the combination was not bad at all. Almost certainly, however, in true Japan fashion, they will be nowhere to be found upon our next visit. Which is part of the fun…who knows what flavor will take its place on the shelf? This entry was posted in food, mike on February 25, 2015 by jules453. 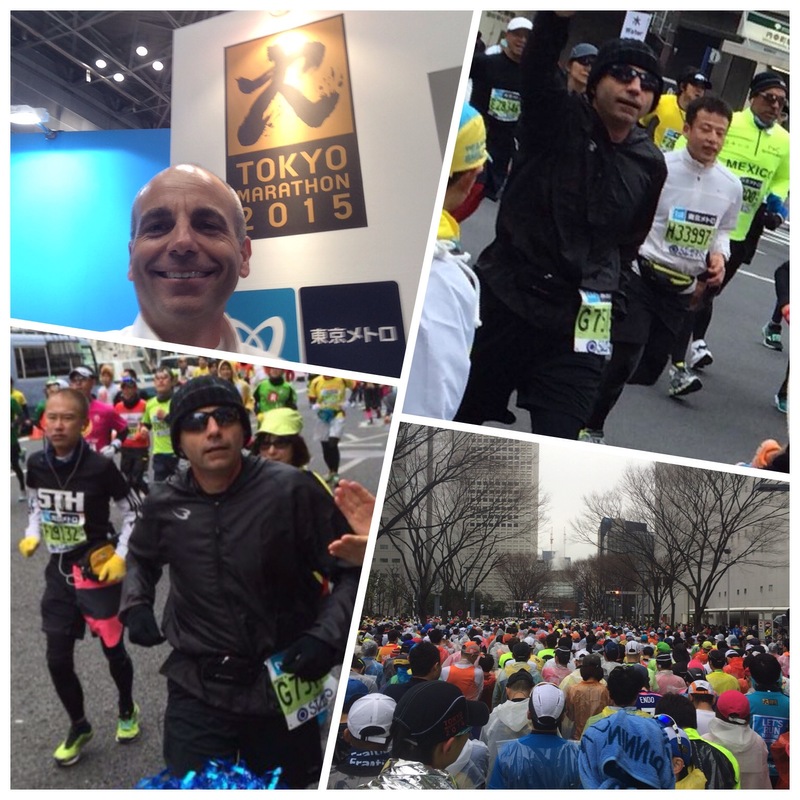 This last weekend was the Tokyo Marathon, one of the “Big Six” worldwide marathons (along with Boston, London, Berlin, Chicago and New York City). I was fortunate enough to be able to run this year’s race (along with 36,000 of my closest friends!). Having not been successful at getting in through the lottery, I entered as a charity sponsor runner and participated on behalf of the Japan Special Olympics organization. 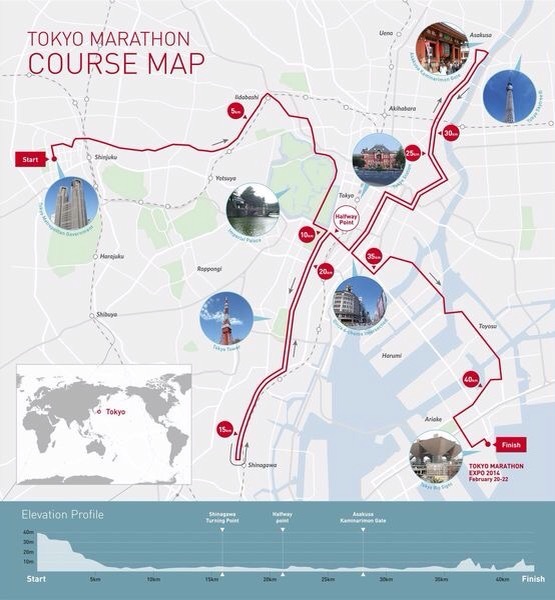 The course starts in Shinjuku, drops down around the Imperial Palace, heads out past the Tokyo Tower to a turn-around in Shinagawa, comes back through Akasaka to Ginza, then it travels out to the Sky Tree in Asakusa, takes a u-turns back to Ginza, and then heads left to the finish at Tokyo Big Sight in Odaiba. A very special thanks goes out to the spectators (most notably my family and friends) that provided much needed support and motivation at all the right places along the route…I can’t begin to tell you how much I appreciate it and how much you helped. This entry was posted in culture, mike on February 23, 2015 by jules453. The seemingly endless stream of unique snacks continues. On a recent trip to the ever-popular convenience store, a new (at least to us) version of those french-fry-like-crunchy-chip-stick things was on the shelf and just begging to be tried. But, tell me, could you resist some salty sausage and mustard flavored bites for just ¥100 (about $1.00)? We sure couldn’t. 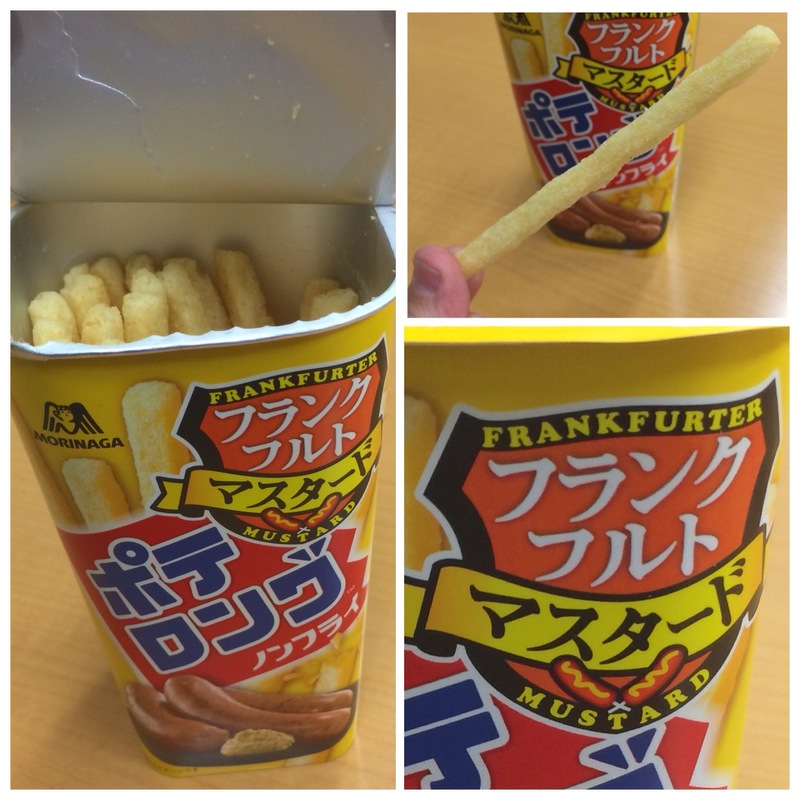 They weren’t half bad, holding true to the advertised frankfurter and spicy mustard flavor. As typical, upon the next visit, these were long gone. This entry was posted in food, mike on February 15, 2015 by jules453. Raw tuna is pretty common here in Japan, whether it be sashimi, sushi, or as some sort of chopped and ‘staged’ appetizer. In this weeks experience, however, it was presented in quite a unique way. The Barracuda Restaurant in Tsukiji, which is unfortunately closing for good in just a few weeks, turned their version into the ‘must do’ shared entree. 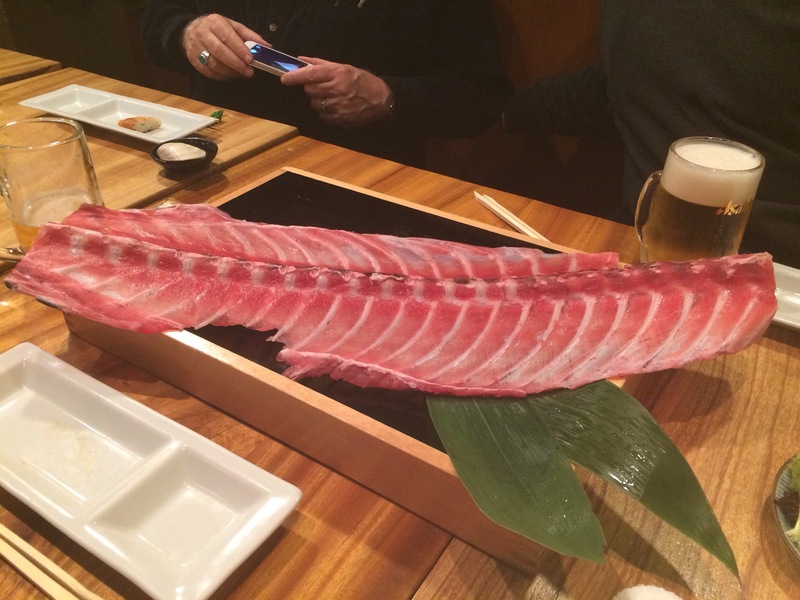 Laid out prominently on the center of the table they offer a slice of the great fish’s ribcage along with a thoroughly cleaned clam shell, some sliced green onion, daikon, and a little soy sauce. Simply take the shell and use it to scrape off some tender meat from between the ribs. Then, add a dash of the onion, radish, and soy as you like (or not, if you just want it ‘straight’) and enjoy. It was a nice conversation piece, obviously interactive, and quite delicious. Hopefully, another restaurant can be found that serves tuna up in the same manner. This entry was posted in food, mike on February 8, 2015 by jules453. You may have heard of Max Brenner’s Chocolate Bar, and how every single item on the menu uses chocolate as one of it’s ingredients, but recently, two of these ‘bars’ have opened up in Tokyo and they are amazing. If you love chocolate, this is the place to go. 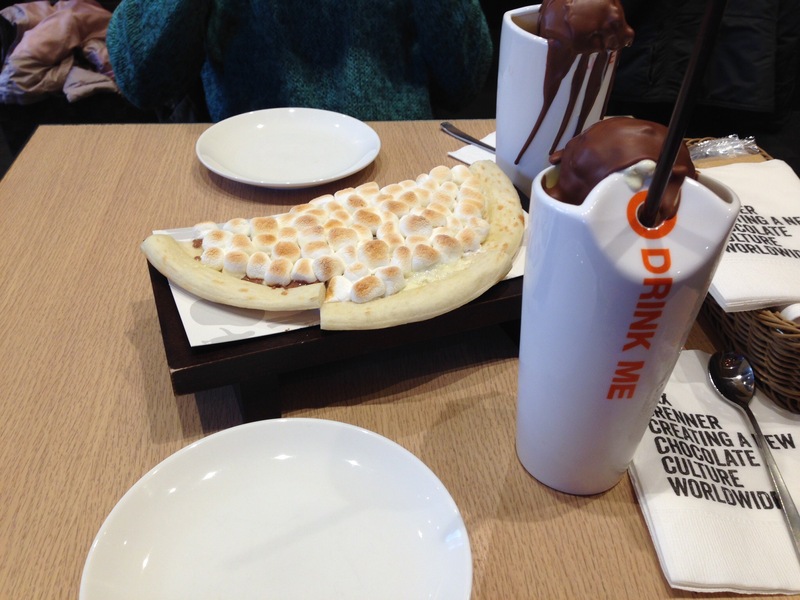 They have chocolate pizza, fondue, and almost every other chocolate concoction you can think of. These bars are extremely popular and there is almost always a wait but if you are in need of a chocolate fix, I highly recommend this. The first store that opened up in Tokyo became too popular so within a year they opened a second joint. I love chocolate and Mac Brenner’s definitely knows chocolate. This entry was posted in food, meg, Uncategorized on February 3, 2015 by jules453.